“Let us make one point, that we meet each other with a smile, when it is difficult to smile. Smile at each other, make time for each other in your family” said Mother Teresa. Happiness comes from one’s heart and if you are happy on the inside, it will show on the outside, especially through a smile. You must put a smile on your face as it will not only encourage others to do the same, but you will feel good and probably have a better attitude for doing it. Walking our dog Maximus in the morning and in the evening, I come across many passersby, some walking and some in stopped cars at the traffic intersections. I make it a point to exchange a smile with most of them. Some do reciprocate and some do not. One day in the evening during my walk, I met a lady carrying two heavy bags in her hands and walking. Many who passed by her, passed a sympathetic glance, which is for sure not going to mitigate the suffering of the lady. As I reached the lady, who appeared to be a new immigrant from South East Asia in her mid thirties, she had put down the two bags and was taking a breather. I suggested to her that I will carry one bag and she can carry the other. Very reluctantly she agreed after saying to me that it would be difficult for me to handle the dog and carry the bag. We moved ahead with me carrying one bag and she the other. Maximus it appears had sensed the situation as he followed me meekly without his usual explorations of the fire-hydrants and the traffic signal posts. (Please refer my blog http:/rejinces.net/2014/07/15/fire-hydrants-and-the-dogs/). The lady asked me as to why I was helping her, to which I said that I thought that she deserved my assistance and my assistance will surely mitigate her agony to some extent. Then I spoke to her about Simon who carried Jesus’ cross. Simon had never heard of Jesus before and when he saw a man being abused and made to carry a cross, he went to help Him when all the Jesus’ disciples had deserted Him with Peter, supposedly the most trusted disciple, even denying that he ever knew or heard of Jesus. After few steps, the lady asked me as to why I smiled at all the passersby and I said that it was a practise I developed mainly to mitigate my own difficulty of walking about 5 km and managing the dog and also to spread a little happiness around. The lady said that she did not smile at people as she did not know proper English. To this I said that a smile knew neither any language nor any boundaries and is the best way to spread happiness around you. You may even add a ‘Hi’ or a ‘Good Morning/ Evening’ if you wish to. The lady said that many a times she did try to smile, but was hardly reciprocated. To this I said that in my case too it was the same. I considered anyone who did not smile back to be less luckier and less happier than what I was and that was why that person did not smile back. One should be thankful to God that one is capable of smiling, despite all the problems one has on hand. The person who did not smile back might have had a bad day at work; may have fought with someone at home or office; may be suffering immense pain or may be sick; or may have lost someone close. After walking a kilometer, we reached the apartment building of the lady and she thanked me immensely for helping her out. She also said that she will make it a point to smile at everyone she came across. As I was about to leave, the lady said that I must become a preacher, to which I said that I do not intent to sell my God. I have always been fascinated by the ‘Smiley ‘ with its various avatars, especially the modern Emoticons. For sure a simple tool to spread happiness in the digital world. 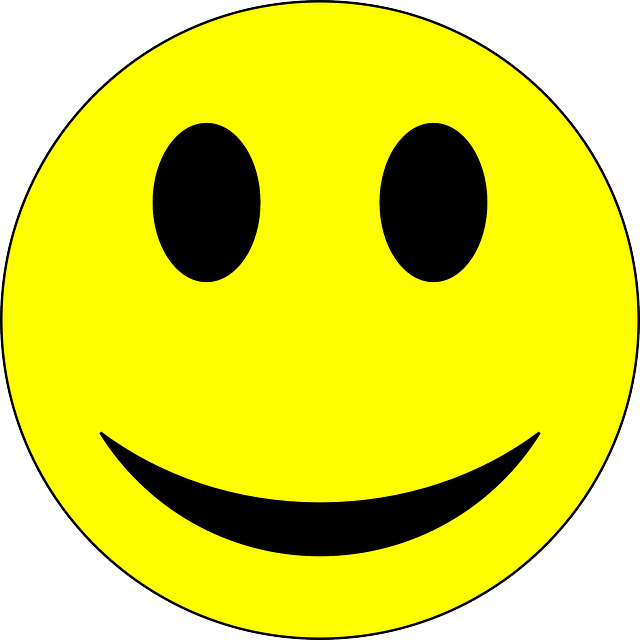 The Smiley arrived in the early 1970s and it was the perfect yellow circle with a childlike depiction of a happy face of two vertical, oval eyes and a large, upturned semi-circular mouth. The yellow background colour was the colour of spring and the sun. The origin of the design of Smiley is contested, it seems that it first appeared in 1963 in American children’s TV programme ‘The Funny Company’, which featured a crude smiley face as a kids’ club logo with a message ‘Keep Smiling’. Harvey Ross Ball, a graphic artist from Massachusetts was the first person to come up with the smiley faces . A company had employed him to come up with something that would boost the morale of its employees. The smiley face was popularized by two brothers, Bernard and Murray Spain, who were in the business of making would-be fad items. Over the period of time, small variations were made on the same idea, but it maintained its original yellow colour. Ball was paid $45 for his 10 minutes work. However, neither he nor the company copyrighted the design. A Seattle designer called David Stern later claimed authorship. In September 1970, two brothers Bernard and Murray Spain, came up with the classic Smiley design to sell novelties. Adding the words ‘Have a Nice Day’, the Spains shipped at least 50 million Smiley badges in 1972. Later it appeared on key chains, coffee mugs, caps, badges, stickers, etc. Emoticons took off as instant messaging became a popular form of quick online communication. AOL’s Instant Messenger in the 1990s provided 12 emoticons. This helped users convey a wide range of emotions with a simple click of the mouse. Emoticons became much more popular with the popularity of online communications and mobile devices. They soon multiplied into a cast of thousands and the users found that they could covey much more without using any words. So Keep Smiling and spread happiness around. Good one. Most of the people turned their face even if we smile at them- may be they are scared of any help request or lack of self confidence. Hi Reji, Greetings. It could not be truer. SMILE & THE WORLD SMILES WITH YOU. Only man can smile in all of God’s creatures. Smile on Saint Reji…… Vanakkam! Best things in life come free, such as a smile that spreads cheer all around. It is not bounded by language & irrespective of culture we must encourage it.